CZM Foundation Equipment has partnered with ML Utilities Fleet Solutions a division of ML Cranes and Equipment based in Charlotte, NC. ML Utilities Fleet Solutions is a fleet solution for utility companies providing rentals, services and parts. ML Cranes began in 2011 and supports the excavation, utility, scrap, demolition, bridge construction, quarry and recycling industries. ML Cranes is a division of McClung-Logan Equipment Company which started in 1939 and has eight locations throughout Maryland, Delaware and Virginia. “ML has a strong history and a tenacious team in place. We are eager to move into this next phase of business with CZM,” said Mickey Hodges, Director of Utilities Solutions for ML. “Our team is looking forward to the partnership with them. They have the premier drill rig for the Electrical Utilities industry,” he said. Hodges says that CZM’s machines work well for the utilities industry because the drill mast center of gravity is closer to the base which equal’s greater crowd force and mast stability therefore more production is achieved in auguring rock holes, and transport weight, and that the setup of the CZM drill is ideal for aiding in production and cost savings to the end user. “CZM product being Made in America with parts and technical support located in Savannah, GA made this an easy choice for ML Utilities decision to partner with Team CZM,” said Hodges. 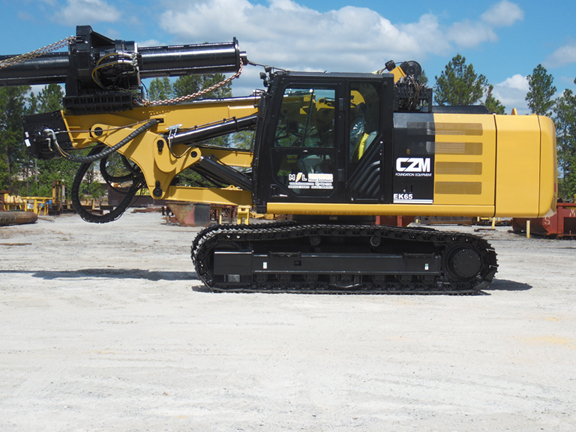 Giuliano Clo, President of CZM said that CZM is known for its superior drilling machines and is eager to provide track drill rigs especially designed for utility work. Machines that will drill holes and assist on setting the poles. “We are looking forward to developing a machine that will not only drill holes but also set poles for utility companies. Most companies will be using our EK65, EK125 and occasionally the EK160, but our engineering team will be working with ML experienced personnel and its customers to refine a perfect solution,” said Clo. ML service technicians will be trained to by CZM technicians and work alongside them in the field, providing the commitment of fast, excellent service CZM customers know. “We are excited to partner with ML Utilities. They bring years of experience with their management, sales and service teams, along with long standing relationships and a deep understanding of what the small utility markets needs are. We know that they will represent CZM well in this area.” Barrett Rahn, US Sales Manager, CZM said. Click here for more information on ML Utilities Fleet Solutions.